So far, the extraordinary anti-government protests in Egypt have drawn much more attention from the news media than from the American public. Only about one-in-ten (11%) cite news about protests in Egypt and other Middle Eastern countries as the story they followed most closely last week. By contrast, more than three times that number (38%) followed news about the aftermath of the Jan. 8 Arizona shooting rampage most closely last week, according to the latest News Interest Index survey conducted Jan. 27-30 among 1,007 adults. For its part, the media devoted more attention to news about unrest in the Middle East (20% of coverage) than any other story last week, according to a separate analysis by the Pew Research Center’s Project for Excellence in Journalism (PEJ). Just 4% of coverage was devoted to the aftermath of the Arizona shootings. As the crisis grew last weekend, so did coverage. From Jan. 27-30, as the survey was being conducted, unrest in the Middle East accounted for 36% of all news coverage, with coverage of Egypt alone accounting for 30% of the newshole. Public interest in the ongoing drama in Egypt and the Middle East, while modest, is in line with interest in other overseas protests in recent years. In fact, more than twice as many said they followed the Egyptian protests very closely than the protests in Tunisia a week earlier (17% vs. 7%). However, the dramatic protests in Iran in mid-2009 – and the subsequent government crackdown – attracted much more public interest. 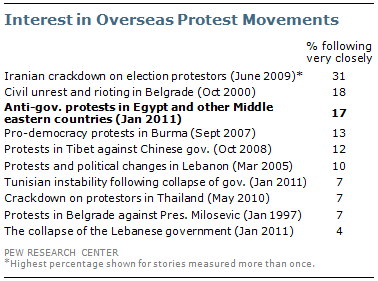 Nearly three-in-ten (28%) followed the protests very closely the week of June 19-22, 2009, and 31% followed the crackdown on election protestors very closely the following week (June 26-29). Last week, the aftermath of the Jan. 8 shooting rampage in Tucson continued to top the public’s news interest, though coverage had dropped significantly. About four-in-ten (42%) say they very closely followed news about the rampage that killed six and severely injured Rep. Gabrielle Giffords, little changed from a week earlier (45%). Nearly four-in-ten (38%) say this was the news they followed most closely, with women much more likely to say this than men (48% most closely vs. 29%). News about the shootings – focused on Giffords’ recovery and new revelations about suspected shooter Jared Loughner – accounted for 4% of the coverage analyzed by PEJ. In the week immediately following the shootings, the various story lines accounted for 57% of coverage. Just more than one-in-ten (12%) say they followed news about President Obama’s Jan. 25 State of the Union speech most closely. Nearly three-in-ten (28%) say they followed this news very closely. That’s less than both the 33% that followed Obama’s 2010 State of the Union and the 37% that followed the president’s speech to a joint session of Congress shortly after taking office in February 2009 very closely. News about the State of the Union accounted for 17% of coverage. Nearly half of Democrats (46%) say they followed this year’s speech very closely, compared with 19% each of Republicans and independents. Nearly a quarter (23%) of the public says they followed news about projections of a record high federal budget deficit this year very closely; 5% say this was the story they followed most closely. The media devoted 4% of coverage to the deficit projections. In January 2009, amidst a worsening economic crisis and just before Obama took office, 35% said they were very closely following news about projections of a record deficit for that year. Fewer (13%) say they very closely followed news about recent gains in the stock market; 4% say this was the news they followed most closely. News about the stock market accounted for less than 1% of the coverage analyzed by PEJ. Meanwhile, 14% say they very closely followed news about a suicide bombing in Russia that killed at least 35 people; 3% say this was the news they followed most closely. The story accounted for 2% of coverage. 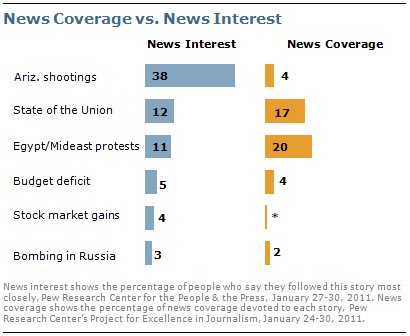 These findings are based on the most recent installment of the weekly News Interest Index, an ongoing project of the Pew Research Center for the People & the Press. The index, building on the Center’s longstanding research into public attentiveness to major news stories, examines news interest as it relates to the news media’s coverage. The weekly survey is conducted in conjunction with The Project for Excellence in Journalism’s News Coverage Index, which monitors the news reported by major newspaper, television, radio and online news outlets on an ongoing basis. In the most recent week, data relating to news coverage were collected January 24-30, and survey data measuring public interest in the top news stories of the week were collected January 27-30, from a nationally representative sample of 1,007 adults. The analysis in this report is based on telephone interviews conducted January 27-30, 2011 among a national sample of 1,007 adults 18 years of age or older living in the continental United States (676 respondents were interviewed on a landline telephone, and 331 were interviewed on a cell phone, including 144 who had no landline telephone). The survey was conducted by interviewers at Princeton Data Source under the direction of Princeton Survey Research Associates International. A combination of landline and cell phone random digit dial samples were used; both samples were provided by Survey Sampling International. Interviews were conducted in English. Respondents in the landline sample were selected by randomly asking for the youngest adult male or female who is now at home. Interviews in the cell sample were conducted with the person who answered the phone, if that person was an adult 18 years of age or older. For detailed information about our survey methodology, see: https://www.people-press.org/methodology/.